NETWORK FINALS: THURSDAY NIGHT FOOTBALL adjusted to 6.8. In addition, LEGENDS OF TOMORROW gained 0.1 in final numbers, but SUPERNATURAL, THE GREAT INDOORS and THE GREAT AMERICAN BAKING SHOW fell the same. Except with respect to some programming on HGTV, Food Network and POP, all cable comparisons are to 2 weeks ago rather than to Thanksgiving night. 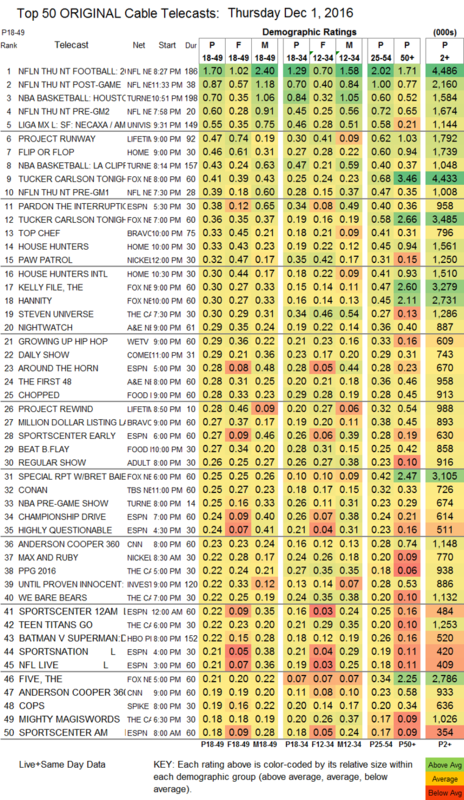 CABLE ORIGINALS: Sports dominated Thursday cable. NFL Network’s piece of THURSDAY NIGHT FOOTBALL was in keeping with NBC’s showing from the marquee game, up 0.42 to 1.70. TNT’s pair of NBA games had Houston vs. Golden State at 0.70, and Clippers vs. Cleveland at 0.43. Univision’s LIGA soccer match was at 0.55. Lifetime’s PROJECT RUNWAY ticked up to 0.47, and FASHION STARTUP was down 0.02 to 0.12. HGTV debuted FLIP OR FLOP at 0.46, then HOUSE HUNTERS was up 0.12 from its Thanksgiving night airing to 0.33, and HOUSE HUNTERS INTL was up 0.08 to 0.30. Fox News continues to enjoy its post-election honeymoon, with the 8PM hour of TUCKER CARLSON TONIGHT hitting the Top 10 at 0.41 (and just barely behind the NFL in total viewers at 4.4M). The return of Bravo’s TOP CHEF was at 0.33, with lead-in MILLION DOLLAR LISTING down 0.03 to 0.27. On A&E, NIGHTWATCH returned at 0.29, and THE FIRST 48 had a 0.28 season premiere. We’s GROWING UP HIP-HOP gained 0.03 to 0.29. Food Network’s CHOPPED rose 0.09 from its Thanksgiving airing to 0.28, and BEAT BOBBY FLAY, which didn’t air last week, was down 0.05 from 2 weeks ago to 0.27. USA’s FALLING WATER dripped down 0.01 to 0.15. POP’s IMPACT WRESTLING rose 0.03 from Thanksgiving night to 0.08. 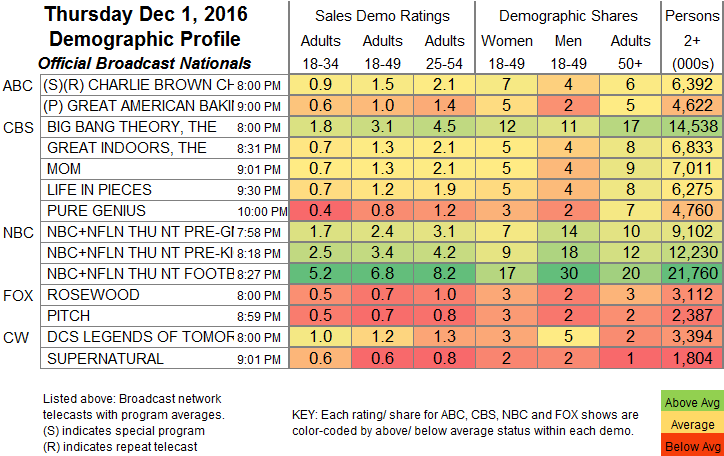 Tru’s THOSE WHO CAN’T was at 0.06, compared to previous airings at 0.07/0.05.